Present: Philip H. Gordon, Assistant Secretary of State for European and Eurasian Affairs; Alexander Vershbow, Assistant Secretary of Defense for International Security Affairs. Michael H. Posner, Assistant Secretary of State for Democracy, Human Rights, and Labor. …Mr. Chairman (referring Sen. Benjamin Cardin – D-MD), you and I visited Belarus this past July along with other members of the Commission. And we had, as I think most people know certainly in this room, had a private meeting with Alexander Lukashenka. 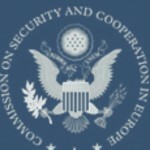 Lukashenka was aggressive in that meeting demanding that our government revoke certain sanctions put on his government by the Belarus Democracy Act, which first became into law back in 2004 and was reauthorized in 2007 and major provisions of it which were adopted into this year’s State Department authorization bill. I know from countless meetings with the Belarusian democratic reformers and human rights activists how these sanctions sustain them against the dictator both materially and morally. …Secondly, I’d like to raise – and if you want to comment on that in a second, I appreciate if you would – on Belarus. Our chairman led us to Minsk. We had an excellent meeting. We had more than a dozen members in a face-off friendly but firm with Lukashenka. And I know, Mr. Gordon, I think on the 14th of August, you met with Lukashenka as well. I believe that was the date, whatever date it was. … On Belarus, indeed I appreciated the opportunity we had to compare notes on this after your trip and before mine. To clarify, I spent some time with the Belarusian leaders, but didn’t meet with President Lukashenka. That could happen at some other time, but we felt this time it was appropriate to do business at a different level. And the business was what we discussed. And I think we had very much the same message, which is that as the Administration has mentioned in other cases, we are open to dialogue and engagement. And we have noticed a couple of signs, not nearly enough, but enough from Belarus to merit talking further about this. And I went to Minsk with a very clear message. And I was the most senior official to go to Minsk for 10 years from the State Department. And we wanted them to notice that as well. And the message was that if they want a better relationship with the United States and certainly if they want any scope for lifting the sanctions that have been put on them, then they need to go about their democracy and human rights practices differently. And that’s the core of the issue. For full hearing transcript go to www.csce.gov.